I don’t know what it is about clothing, but it’s hard for me to find anything that fits well. It’s nearly impossible for pants, but I’m starting to find it for shirts, too. Normally, I can find long-sleeved shirts (sweaters) that fit fine. However, when I get button up shirts, those are hit-and-miss – usually miss. I find that with jackets, too. I think it’s because there’s only size Small, Medium, Large, Extra Large, and sometimes even beyond that. I can only ever fit into a Small or maybe a Medium, but it’s becoming more and more rare. Even size Small is sometimes too big for me. I think it’s because shirts are collapsing too many properties of a body into a single size. For a shirt, there is neck size, sleeve length, width of your chest, and width of your stomach, and how close you want the shirt to be to your body when it fits (tight fit vs. loose fit). The assumption of Small/Medium/Large is always as the person gets bigger, so do the corresponding parts of the clothes. But not necessarily, a smaller person can have regular length arms but a thinner belly. But since a manufacturer is trying to have a few sizes as possible, they just guess the average proportions and figure it fits most. Most of the time it doesn’t fit me. Trumaker – they send someone out to your house to measure you and create a custom fitting shirt! Probably the most reliable. Proper Cloth – you can measure yourself and then create your own shirt… if you sign in and create an account. Hopefully you can measure yourself properly. Untuck It – Uses a chart to more-or-less fit their shirts to your size. Probably not quite as accurate as the others for the reasons I mention. Bonobos – A lot less customizing, but maybe it’s okay. I hear it advertised on some podcasts I listen to. An app on my iPad, MTailor – I can’t remember the name of the app, I think it’s Untucked Shirts – where you take a picture of yourself wearing spandex and they send you a custom shirt. I thought about doing this but can’t quite get over sending someone else a picture of myself wearing spandex. I am tempted to use one of the first two services. The main drawback is that the shirts are about $90. That’s more than I have ever paid for a shirt, probably double my most expensive shirt. Certainly, the shirts are nice… but it’s a lot to spend on a shirt. But if it fits? Well, then maybe it’d be worth it. I’ve been going to physical therapy for over a month now. I had been going twice per week but the physical therapist said I could reduce that. In the meantime, I’ve been doing exercises either every day or every other day and in that time I discovered that my right leg – the one that had surgery – is much weaker than my left leg. Now, you may be tempted to say “Well, no kidding. You had surgery on it.” And, that’s true. But I think it’s been true for a long time before that. I can remember doing rehabilitation before with my other surgeries and I always had a more difficult time doing load bearing exercises with my right leg. Now that I am forcing myself to do it more often, I can tell it’s weaker. I can’t dip it as far, I can’t hold as much weight, nor can it take as much tension. I’m not sure why that is. I’m right handed and my right arm is stronger than my left, I am unclear why the bottom half of my torso is the opposite. This past weekend, I was reading the Ask Dan column in the Wall Street Journal. Dan Ariely is a behavioral psychologist at Duke University and I read his blog all the time. He posts about once every two weeks. I’ve also read all three of his books. I have lots of friends who grew up outside the U.S., and they often tell me that their social lives here aren’t as good as they were in their home countries. Are they just romanticizing their homelands, or are we Americans doing something wrong in our social relationships? I agree with your friends—and I don’t think their memories are just biased and romanticized. Social life in the U.S. isn’t as good as it could be because Americans try too hard to be social. I grew up in Israel, where friends simply stop by unannounced. This means that, as a host, you aren’t prepared, and no one expects to you to be. In this mutual low-expectations setup, visitors simply get integrated into whatever is going on. If they show up at dinnertime, they pull up a chair; if they come beforehand, they help chop vegetables. In the U.S., on the other hand, we plan to see someone in seven weeks at 8 p.m., and everyone gears up for the occasion. The hosts clean the house and cook something special; the guests dress up and bring a gift. The whole process demands much more effort, and we therefore do it much less frequently. Maybe we should all lower our expectations and raise our appreciation for serendipity in our social lives. At least, it’s more true for me now than before. Back in my early twenties (when I had a driver’s license and a car), my brother and I used to head over to our friend Butters’ place. My brother had this habit of walking in and saying “Hello, Butters!” and making himself at home. He wouldn’t even knock on the door. Eventually I started doing the same thing. We had plans to meet up ahead of time, of course, but once we showed up we were better-than-guests. Indeed, we used to head over to friends’ places all the time and stay late. Doing whatever. I also sort of remember relatives showing up unannounced, although that would mostly just be my aunt, or vice versa. They’d show up and help out with meal preparation. But now, I would never dream of doing that. If I meet up with someone, there are definitely scheduled plans in advance. I wouldn’t show up anywhere without letting the homeowner know. That’d be awkward (the one exception is when I first moved to Seattle 8 years ago and used to head over to my friend Frank’s place every Monday; I used to walk in there, too, but then he started locking his door). Now that I read about this difference in cultures, I’m not sure I like the current culture better. We used to spend all manner of hours at friends’ places, and vice versa. And it was casual, relaxed, and we’d make food for each other, usually popcorn. Am I missing something now with this change? Maybe. I’m not sure how to change it, though. I’ve been thinking a lot recently about my recent post about how I’m not as clever as I think. In that post, I talked a lot about how experts and scientists believe one thing, but the general public believes another and the two views are not compatible. For example, scientists are unified in their belief that vaccinations do not cause autism, but a much larger proportion of the population thinks it does. I decided to take a look at one of the beliefs where this is a gap between regular people and experts, and this is the idea that evolution never occurred. This is a belief that is prominent in the US (but much less so in other developed nations). As you can see, there is no majority but at least 50% of US adults believe that evolution occurred in some form. But on the other hand, 72% of adults believe that it was divinely guided by God – either God directed evolution or straight up created humans the way they are today with no evolution from earlier life forms. I’m going to look at the “Evolution occurred by guided by God” perspective. This view, in my opinion, is an attempt to eat our cake and have it, too. It retains the belief that is compatible with religion – that God created the world intentionally – while also acknowledging the evidence that says that evolution happened. Some young earth creationists – those that believe that humans were created in their present form – grant the middle group no leeway. To them, even acknowledging evolution occurred, even if guided, is wrong. I think they are a minority because more likely than not, most people just believe certain things about the origins of humanity and don’t think too hard about it. But others in the 42% will probably think that some forms of divinely guided evolution are okay, but not others. Within theistic evolution, there are two spectrums. On the one hand, there is the deistic view. God kicked off the universe in the Big Bang and then sat back and watched it all unfold. At no point did He get involved but just made the most of the situation. Then there’s progressive creation where God suddenly created groups of plants and animals at certain points. Then there’s true theistic evolution where natural selection happened but God was involved every step of the way. He caused certain traits to evolve in order to bring about how humans look today. In other words, God created humans in their intentional form but used a process to get there. I can appreciate this middle position’s attempt to find a middle ground. 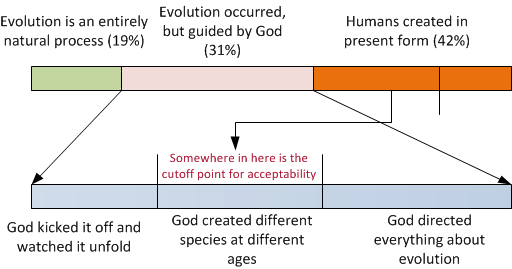 However, there is a weakness in the middle position that leans further to the right hand side of my chart – the theory of evolution and the idea that God directed evolution are contradictory. It’s like saying there’s such a thing as a square triangle. In this picture, humanity is moving in a straight line from a less complex ancestor to a more complex descendant (the picture above shows a monkey which is not where humans actually evolved from). Our tendency to look at what’s left and ignore other possible branches is called survivorship bias. Even though A-B-C-D is the path that occurred, it could have been A-I-M-O or A-B-C-H. This randomness is how evolution works. Evolution is not random, but instead is the non-random survival of random mutations. Those that can better reproduce will pass on their genes pass and their genetic material to their descendants, and those that don’t go extinct. But the ones that can better reproduce get to be that way because of a random genetic mutation (a copying error from their predecessor’s DNA) because of either a blip or because of environmental factors. But sometimes, these copying blips work in their favor and they gain a reproductive advantage. That is a massively oversimplified explanation of natural selection. But the point is that is evolution by natural selection is directionless. If genetic trait A occurs randomly and works, then it survives even if genetic trait B would have been better 10,000 years from when genetic trait A appeared, all things being equal. There is no specific outcome in evolution; rather, whatever works survives. There is no end goal, it just occurs in response to environmental pressure. Thus, in our lottery example above, A-B-C-D occurred for no specific reason, that’s just what ended up winning. But if you know it could have gone in any number of ways, you would understand that it was a winner by chance. Evolution produces winners that uses chance to mix things up, but no specific outcome is guaranteed. And this is why I think the belief that evolution was directed by God is problematic. To say that evolution was directed by anything contradicts the underlying basis of the theory – that it is not directed and whatever happens, happens. To believe in theistic evolution means that you don’t believe in evolution as understood by scientists, but that God used a certain process to bring humans into existence gradually over time. 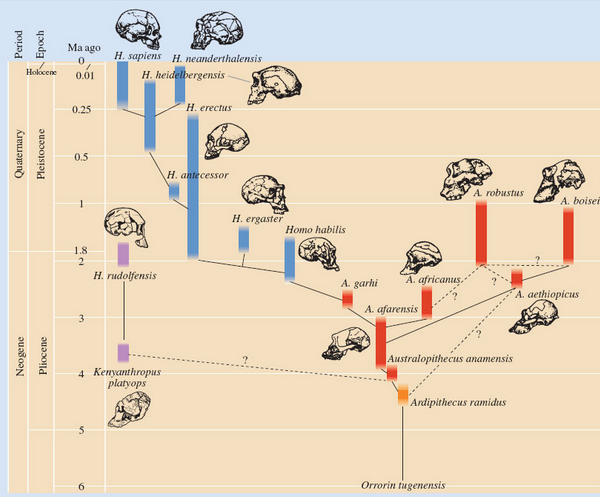 We may think that humans evolved in a straight line, but we didn’t. It’s actually more of a spider web than a straight line with many dead ends and parallel paths. It’s by chance that homo sapiens ended up as the winners. It turns out that the deistic belief is closer to what scientists believe, and makes sense for more conservative creationists to reject it (although they would reject Deism for reasons other than evolution). Now, does it matter if you believe one or the other? Well, that’s hard to say. We humans are pretty good at rationalizing our beliefs and I have tons of belief I rationalize, both consciously but mostly unconsciously. And most people don’t care enough to differentiate the way I’ve done in this blog post. And let’s face it – few people read this blog or ever will read it, so what I think doesn’t matter. And what I think you believe doesn’t matter. And I’m okay with that. Hopefully you are, too. A couple of weeks ago, my current tenant in my condo notified me that she had to move out. This was due to her needing to be closer to her family. It was mid-month and she had to move out within a short period of time. My lease agreement says that a tenant can move out earlier than the expiration on it but they need to pay two months rent in order to do so. I decided not to bother enforcing it. My tenant did a good job of cleaning up the unit, however. It was cleaned from top to bottom and is move-in ready so I don’t have to spend any time ensuring that it is in good condition before getting new tenants. And guess what? I put it on the market on March 1, and by March 7 (today), it’s rented out with a start date of April 1. While I don’t like having a month’s loss of income I am lucky enough to be in a position that I don’t need it. And with this new set of tenants, I am able to raise the rent by $225/month from the previous time I rented it out. This means that the loss of rental income for one month while it sits empty will be offset in about 4 months. In other words, by the end of the year, it will have generated more revenue at the higher rate with a loss of one month than my former tenant being in the unit for an entire year. That, combined with my time saved because of my tenant cleaning it up, is why I wasn’t enforcing the escape clause. My strategy in pricing my unit is to be very competitive with the market. I took a look on Craigslist for apartments in the area of similar size and they are all going for $100-$200 more than I was charging. This ensures that I got a lot of applicants (I got around 12) and it doesn’t stay empty for long. I had to take down the ad after one day, I was getting so many replies. You may be tempted to think that I priced it too low, and that’s possibly true. But, pricing it lower ensures it fills up faster and it prevents tenant expectations from getting too high. After all, it’s lower than everywhere else so it’s not going to be too flashy. Personally, I think my tenants are getting a good deal. My rate includes water, sewer, and trash which over half the time aren’t covered in other apartments. I also repair pretty much everything in the unit when it goes bad. Last year, I replaced the windows in the condo at a cost of $5600 at no expense to my tenant. The drawback of pricing it lower is that it still loses money; the rent is still about $200/month lower than it needs to cover all the expenses (mortgage payment plus property tax plus mortgage insurance + homeowner dues). But by my math, in 3 or 4 years (probably 4), the condo will finally be making money. It will have only taken 10 years.